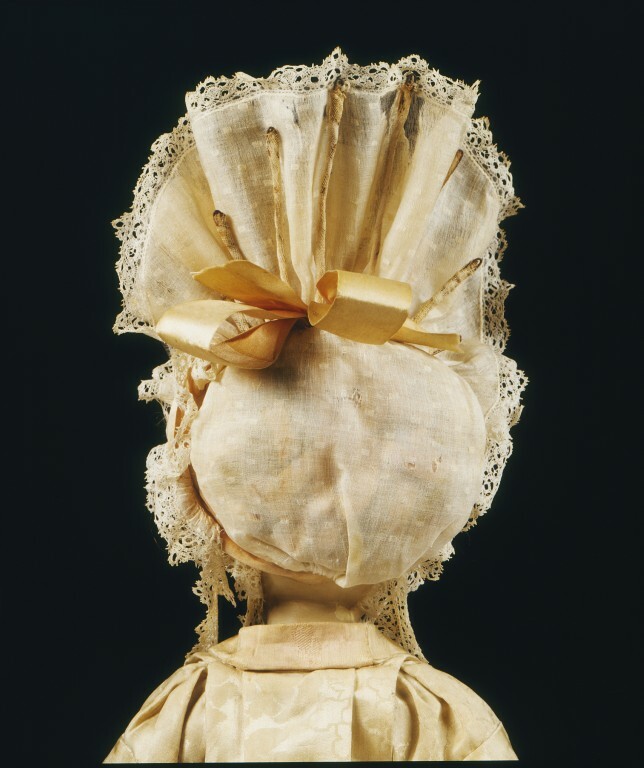 This cap was made for a doll, known as Lady Clapham, that is thought to have belonged to the Cockerell family, descendants of the diarist Samuel Pepys (1633-1703). The daughter of Pepys's nephew John Jackson (the son of his sister Pauline) married a Cockerell, who had a family home in Clapham, south London. 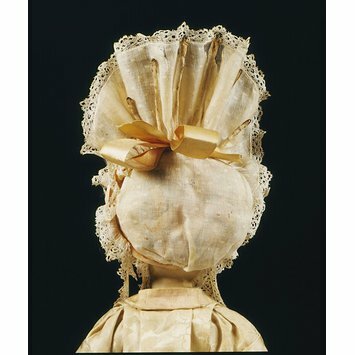 Circular doll's cap consisting of the cap, wire and ribbon. The cap is made of spotted lawn edged in English bobbin lace which falls into two lappets on either side of the face. It has a graduated double frill ('Monte la haut'), a narrower frill in front and a taller frill behind. The frill is supported by a wire covered in muslin formed in a semi-circle with eight radiating spokes graduating to the highest in the centre. The cap is circled with pink silk taffeta ribbon which is twisted about the cap, and is tied in two bows and lined with brown silk. The ribbon is padded in between and sewn to a cotton band which forms a base to attach to the doll's head. The cap is secured by a linen cord drawn through the back breadth.